Rangers manager Jeff Banister agreed with Gallardo’s comments. In 2015, Gallardo’s only other season with Texas, he was 13-11. Gallo also has been on a roll, with 10 of his 31 homers in his past 19 games. He went 3 for 5 to raise his batting average above .200 for the first time since June 16. 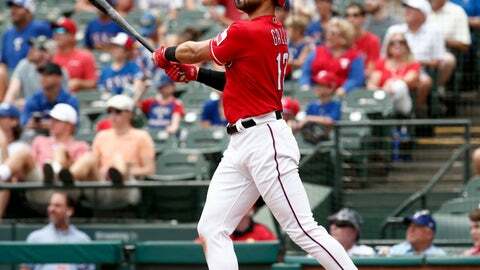 Gallo’s homers against Seattle starter Marco Gonzales gave him 12 against left-handers this season, the most by a Texas left-handed batter since Rafael Palmeiro hit 15 in 2003. Gonzales (12-7) gave up career highs of 12 hits and seven runs in five innings. He has lost two games in a row after a career-best five-game winning streak. Seattle led only in the first inning. With one out, Jean Segura walked, went to second base on Gallardo’s wild pitch and scored on Mitch Haniger’s single to center field. The Rangers came back for a 2-1 lead in the bottom of the first. Mariners: 1B Ryon Healy (heat-related illness) and RHP Sam Tuivailala (strained right Achilles tendon) left the game. Manager Scott Servais said Tuivailala is likely to go on the disabled list. . RHP Erasmo Ramirez (strained shoulder muscle) is scheduled for a fifth injury rehab start, with Triple-A Tacoma. Ramirez has been on the disabled list since May 1. … RHPs Dan Altavilla (sprained elbow) and LHP Roenis Elias (strained triceps) will go on rehab assignments “real soon,” Servais said. Rangers shortstop Elvis Andrus doubled in the first inning to extend his hitting streak to 19 games, tying Cleveland’s Michael Brantley for the major league season high. On Tuesday, on his sixth try, Texas RHP Bartolo Colon reached a goal of 246 wins to become the winningest MLB pitcher born in Latin America. According to manager Jeff Banister, Colon will not be taking it easy. “We’re still in the same rotation as before (Tuesday’s) game. Colon is tied for 50th among all pitchers, with five of those ahead of him foreign-born. Hall of Fame pitcher Bert Blyleven, born in the Netherlands, holds the record for wins by a non-American-born pitcher with 287.